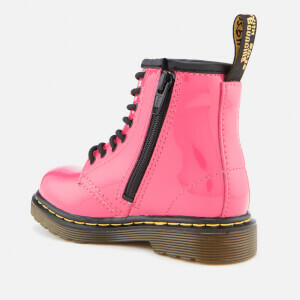 Kids’ leather boots based on the iconic 1460 silhouette from Dr. Martens. 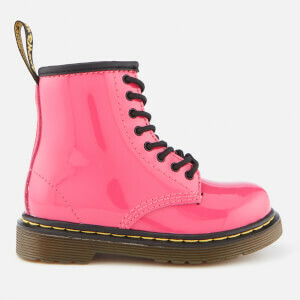 Crafted from hot pink patent Lamper leather, in a high-shine glossy finish, the 8-eyelet boots feature an inside zip closure at the ankle to easily get the boots on and off. Set on a durable air cushioned sole that is cemented to the upper, the boots feature the signature sole pattern for added grip and side grooves. 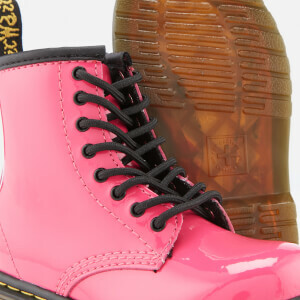 Complete with contrast yellow stitched welt and an ‘AirWair’ woven brand tab heel loop.